Before the 2008 collapse of Lehman Brothers, the Fed’s balance sheet stood at $925 billion—mostly U.S. Treasury securities. After 59 months of asset purchases to push down longer-term interest rates, it had ballooned to a peak of $4.5 trillion, including nearly $1.8 trillion in mortgage securities, in 2014. In October of 2017, the Fed at last began a slow slimming-down of its balance sheet, allowing a growing amount of maturing securities to roll off monthly without reinvesting the proceeds. In former Fed chair Janet Yellen's words, the central bank did “not have any experience in calibrating the pace and composition of asset redemptions and sales to actual prospective economic conditions.” She therefore stressed that the Fed saw its balance-sheet reduction primarily as a technical exercise separate from the pursuit of its monetary policy goals—in particular, pushing inflation back up to 2%. The Fed's main tool for tightening monetary policy in a recovering economy would, therefore, she explained, be raising short-term market interest rates by paying banks greater interest on reserves (IOR). Since December 2015, the Fed has raised the rate on IOR by 195 basis points (1.95%), which has pushed up its short-term benchmark rate—the effective federal funds rate—in tandem. By historical standards, the Fed’s rate hikes have been cautious. Even with inflation on target and unemployment at historic lows, the Fed has been raising short rates more gradually than in any tightening period going back to the 1950s. We believe, however, that rate hikes understate the degree of tightening the Fed has imposed over the past year. 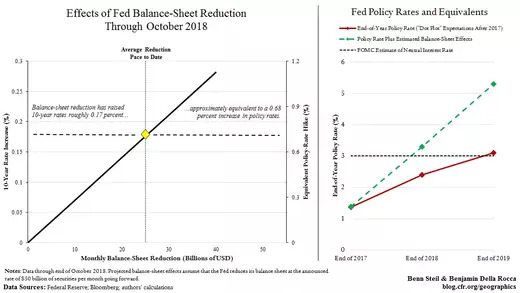 The reason is that the Fed appears to be underestimating the impact of its balance-sheet reduction. Here is why. Longer-term bond yields in the market, which the Fed is looking to nudge upward as it tightens policy, can be separated into two components. The first is the expected path of short-term interest rates. Changes in the Fed's policy rate, its guidance about the pace of rate hikes, and the economic outlook all affect the expected path of short-term interest rates. The second is a term premium, which is the compensation that investors require for holding a longer-term bond (as opposed to rolling over short-term bonds for the equivalent length of time). The term premium fluctuates with supply and demand for particular bonds. The Fed's accumulation of longer-term Treasuries during nearly five years of Quantitative Easing (QE) was a big source of demand, and therefore lowered the term premium on longer-term Treasuries. (Former Fed Chair Ben Bernanke explains this well in his blog.) Fed economists estimated that yields on 10-year Treasuries at the end of 2017 would have been around 85 basis points higher than their then-level of 2.3 percent had the Fed not bought such bonds. On the basis of these estimates of the effect of central-bank asset purchases on long-term rates, we calculate that asset run-offs so far—$24 billion per month on average—have boosted 10-year Treasury yields by about 17 basis points. Historically, an effect of that magnitude is roughly what we would expect from a 68 basis-point hike in the Fed’s policy rate—as the left-hand figure above illustrates. Our calculations also suggest these balance-sheet effects will soon get larger. If asset run-offs continue at the Fed’s announced pace ($50 billion per month), then by the end of 2019 they will tighten monetary conditions as much as a policy-rate increase of 220 basis points (2.2 percentage points)—as the far-right end of our right hand figure shows. What are the implications for the U.S. economy? The Fed estimates that once interest rates surpass three percent—their “neutral level”—monetary policy will shift from stimulating economic growth to constricting it. Today, the Fed expects that rates will remain below this neutral level until the end of 2019. But by our calculations, the combined effects of balance-sheet reduction and conventional rate hikes will produce an equivalent tightening in monetary conditions much sooner: by the end of 2018. This fact suggests that monetary policy will start to contract economic growth early next year. Foreign Capital Has Been Propping Up China’s Currency. Here’s What Happens When It Leaves.